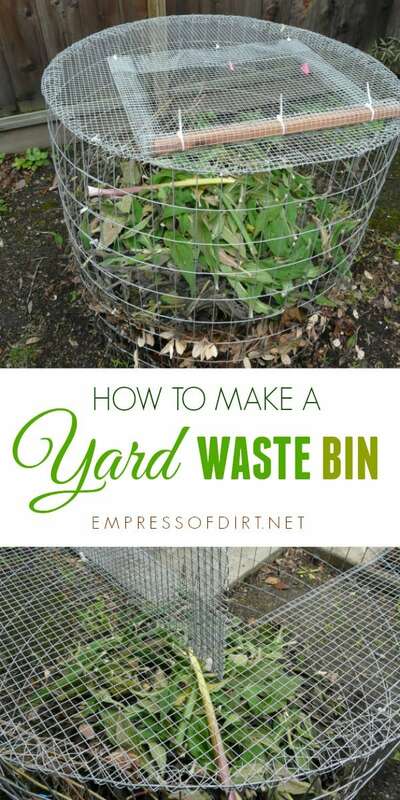 This DIY project could be a yard waste bin or a compost bin, depending on whether you have an issue with critters or not. Either way, if you like working with hardware cloth, it’s a good starting point for making all sorts of wire mesh containers. 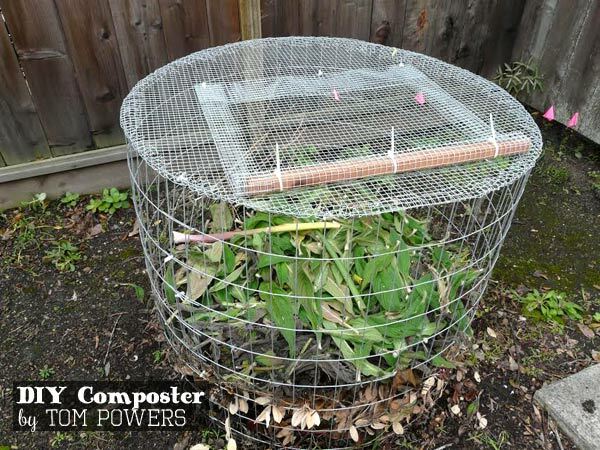 See this post for a rat and mouse-proof compost bin. This wonderful piece of functional art was created by my friend Tom Powers. I have a hunch he regards stores like the Home Depot (or where I live, the farm supply store) as potential art supply shops just like I do. 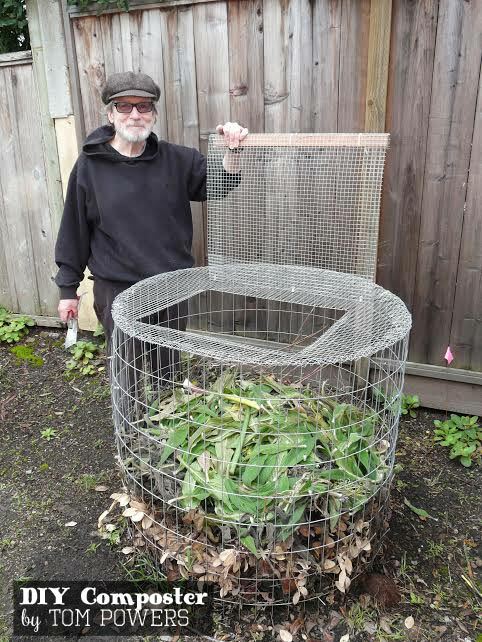 Using two sizes of hardware cloth, he created this compost bin for his ocean-side home. In my garden, I would use a bin like this to store leaves as they decompose into leaf mould. Hardware cloth has many uses in the home and garden. I use it to make screen tops to keep critters out of my veggie beds. This metal “cloth” comes in many different grid sizes, widths, and lengths. Approximately 12 feet of wire fence hardware cloth (also known as ‘welded wire utility fence‘) forms the circular container. Electrician’s plastic wire ties (zip ties or cable ties) for connectors, hinges and to capture the redwood handle. The lid and top of the bin is made from a finer mesh hardware cloth. All edges on the top were bent to form a hem and make the hinged lid a bit stiffer. Tom lives by the ocean the bin will slowly self-recycle itself. 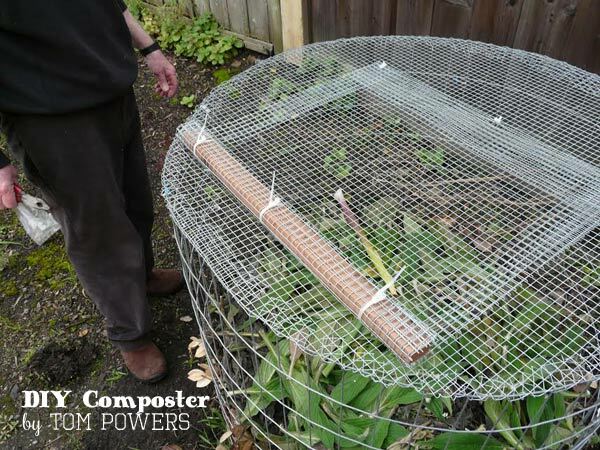 This style of compost bin won’t suit everyone—I would use it for large yard waste— but it opens up a whole bunch of ideas for hardware cloth garden and garden art projects. You cut hardware cloth with wire clippers/snippers. The strength of the wire varies greatly depending on the manufacturer, so be sure to purchase clippers that work easily on the hardware cloth you’re using. Also, bending back the wire to form hinges and joins can be tricky: there will be sharp wire ends to contend with. Wear safety glasses and gloves for your own protection. This same method could be used to create a free-standing vertical planter. Or create shapes like giant letters or hearts. Fill them with soil, plants, or stones to make cool garden art. Tom Powers is a Draftsman and Technical Illustrator and creator of cool stuff. You can follow Tom on Facebook here. From my research, compost needs to be mixed, or turned occasionally. 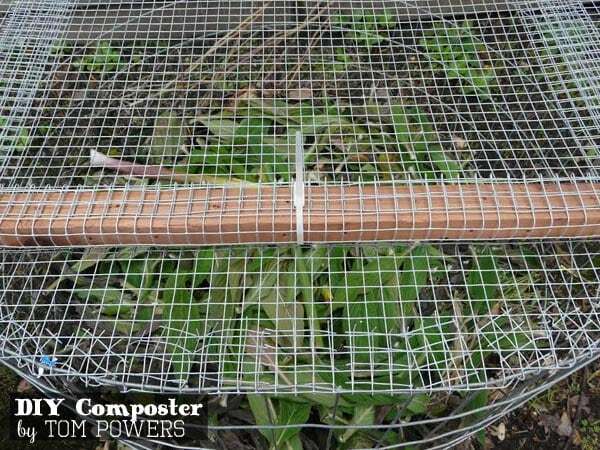 If I build this compost enclosure, is it easy enough to turn while keeping it in the ‘cage’, or do you have to lift away the cage, turn, then shovel it all back in? 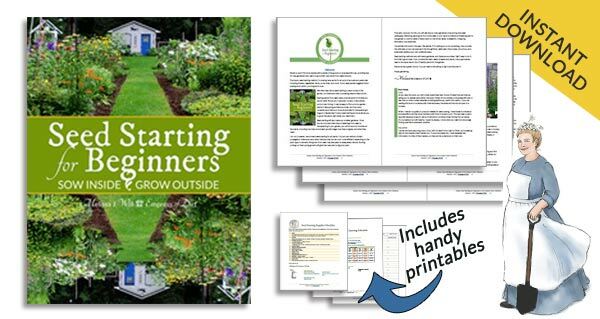 I’m looking for something to keep my dogs out of the compost pile, that I can still access easily. TIA! What’s the point of building this? Why not just keep it in a pile ? I think this one because it looks doable and very affordable!